In 2017, General Motors announced plans to reveal 20 new all-electric vehicles by 2023, a key element of our vision of a world with zero crashes, zero emissions and zero congestion. We know it’s an ambitious goal, and we’re helping to put the foundation in place to ensure the EV market thrives. This means working to shape industry standards and policies that will propel EV technology, supporting sustained investment in charging infrastructure and partnering with state and local stakeholders to implement EV education programs. Increasing product exposure: We’re leveraging the Bolt EV in our expanding Maven ridesharing programs in San Francisco and six other cities to achieve our goal of getting more people into EVs. After just one year, passengers have driven more than 21 million electric miles and saved more than 864,000 gallons of gas in Maven’s growing electric vehicle fleet. Experiential marketing: Some consumers still think EVs are cramped and drive like golf carts. The fact is many first-time EV drivers quickly find these vehicles have great acceleration and are fun to drive. 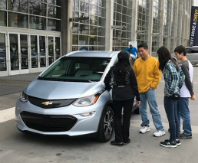 Hosting test drives at auto shows and giving consumers a chance to experience EVs is the most effective way to address misconceptions and drive awareness through word of mouth. In the past year, we’ve taken the Bolt EV to 28 auto shows across the country, completed more than 2,700 test drives and totaled over 3,800 EV miles driven. We also employ print and digital advertising in key markets and channels where conversations around electric vehicles are taking place. Collaborating with partners: We can’t get it done alone. Collaboration between automakers, states and key industry stakeholders is essential to scale consumer reach and adoption. Through our partnership with VELOZ in California, we support the “Electric for All” campaign, a public education and awareness movement to speed the expansion of California’s electric car market and its charging network. We also partnered with the Northeast multistate “Drive Change. Drive Electric.” awareness campaign. This public-private partnership works to advance consumer awareness, understanding, consideration and adoption of electric cars while promoting air quality and public health improvements. Shaping infrastructure and industry standards: Consumers want to be assured that they can get to wherever they want to go. We work with the electric utility industry, EV charging service providers and numerous EV-related state and local stakeholders to help build an EV charging infrastructure. In the past year, we’ve supported more than 20 utilities in program filings, testified in over 10 state and federal legislative and regulatory hearings and reviewed state plans, filing more than 50 official comments with states. As a result of these types of joint efforts, electric utilities have received more than $1 billion in EV-related investments with more support to come, and 42 states have committed to investing in EV infrastructure. In the U.S. and Canada, General Motors has more than 700 workplace chargers at 49 of its sites. Solar charging canopies have been installed at nine sites so employees can use renewable energy to charge their EVs while at work, and we encourage other companies to provide workplace charging. Leveraging vehicle incentives: We all want a good deal, especially when trying something new. We advocate for expanding state and federal tax credit programs so more consumers are encouraged to go electric. Incentives in states such as New York, Massachusetts, Connecticut, Colorado and California can help tip the balance in favor of EVs. For regions with high traffic congestion, such as Atlanta or Los Angeles, establishing carpool or HOV lane access for EVs has proven to be effective in bringing them to the top of consumers’ minds. Although we’ve seen an increase in EV awareness, there is still work to be done. As we innovate and deliver new EV solutions, we’ll continue our efforts to help consumers embrace EVs while improving fuel efficiency throughout our existing vehicle portfolio. To learn more about our activities around EV commercialization, click here for a Q&A with Britta Gross, director of Advanced Vehicle Commercialization policy.